Home / Heel Pain Playing Golf? Suffering With Heel Pain Playing Golf? Here’s 3 Things You Can Do To Start Enjoying Your Golf Again – Without Heel Pain! 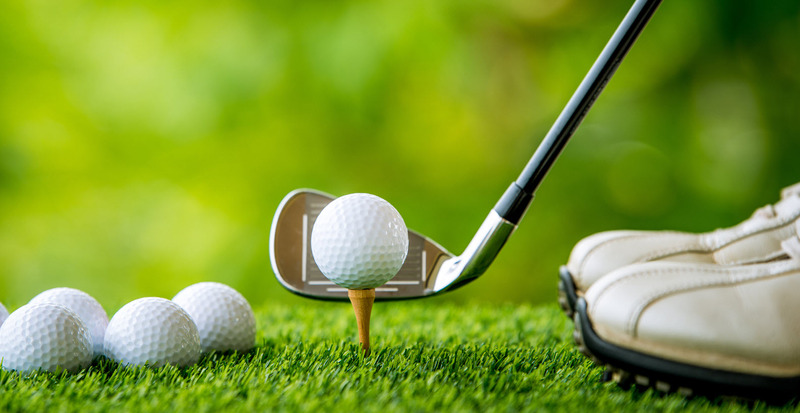 Do you agree that golf is quite a unique game? It can be so pleasurable and yet so painful at the same time? Just trying to hit a tiny ball 400 yards into a hole the size of a tea cup can seem insane! And if you’re suffering with heel pain playing golf, then this can just add to the challenges. It can even add to the numbers on your scorecard…..aarrrrgggghhh! Suffering With Heel Pain Playing Golf Is REALLY Common! After recently attending a dinner following the Murray Bridge Pro Am, conversation opened up about where I worked. You see my husband had recently taken over as the Club Pro. Both myself and my children were there to support him. And this was my first time meeting the local club members. Well once our table heard I worked at the Foot & Leg Centre the conversation quickly turned to feet, and I was surprised to learn that almost every second person at the table suffered from heel pain – one of the most common complaints experienced by golfers. So Why Are You Feeling Heel Pain Playing Golf (or Afterwards)? Heel pain is commonly caused by excessive pronation (flat feet) and it’s often the plantar fascia that becomes painful. The plantar fascia is the flat fibrous band of tissue that connects your heel bone to your toes. This is what supports the arch of your foot. So when the feet are mis-aligned and flat, the plantar fascia becomes over-stretched and strained. resulting in micro-tears and injury. It is the strain, damage and injury to the tissue that you feel as pain. This can result in inflammation of the plantar fascia (plantar fasciitis) or degeneration and deterioration of the plantar fascia (plantar fasciosis). 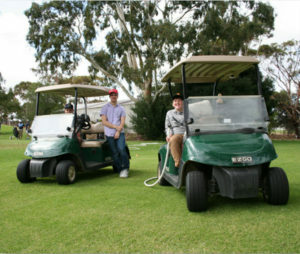 Other contributing factors can include poor/soft footwear, poor training methods/techniques (think golf swing), tight calf muscles, a recent increase in body weight, or a sudden increase in sporting activity (eg playing more golf). How Can You Ease Your Heel Pain Playing Golf (or Afterwards)? And Have A More Enjoyable Round? Stability in your shoe is key. Shoes that keep your feet balanced and supported will help improve your posture and weight distribution during your swing. When your feet feel good this will have a flow on effect to the legs, knees, hips and lower back. They won’t have to work as hard and compensate for the foot pain meaning you will have better concentration on your technique, meaning better speed, swing, follow through and placement of the ball. What features can you look for when hunting for your ideal golf shoe? 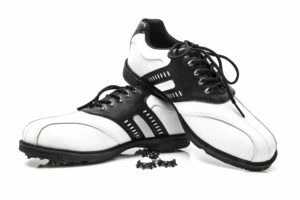 Its best to try on a new pair of golf shoes after you have played your round or towards the end of the day. Because our feet can swell this ensures you’ll get the right fit. Remember shoes that are too tight during your round, further adds to your pain and discomfort. Remember to wear the same type of socks that you would normally wear during your round. This also helps you to gauge the correct size when you’re trying on your new shoes. Try on a pair of shoes and not just one shoe as your feet can vary in size and shape. Choose the size that provides maximum comfort for both feet. Good traction will help you to avoid potential injuries caused by slipping on uneven and possibly wet terrain. Shoes with removable spikes are ideal as you can not only replace them as needed, but you also have the option of removing spikes that are directly under the ball of the foot if you suffer with pain in this area. To help ensure you cut the risk of developing a fungal infection make sure you dry out your shoes before wearing them again. If your feet tend to perspire a lot, finding a breathable/moisture wicking shoe is ideal to keep the feet feeling fresh. The same goes with your choice of socks. This will help keep your feet drier during a round so that your heels don’t slip so much within the shoe. Look for a stiffer soled shoe and/or a shoe that has a removable insert. This will give you support and allow for additional arch support if required. Good arch support is needed if you want to help reduce the pain. By supporting the arch the stretched fascia is offloaded and this aides in healing. Shoe inserts such as orthotics can further assist offloading. If you also suffer from pain in the big toe joint (another common golfing symptom), a stiffer soled shoe will help to prevent overextension of the big toe joint. Especially on the back foot when you follow through on your swing. Repeated over extension of the toe joint can lead to earlier wear and tear on the toe joint, which can result in arthritis. Getting shoes wide enough ensures enough room for the toes. If you also suffer from bunions or hammer toes additional comfort can be found in a shoe that is softer and more flexible in the upper. A shoe repairer may also be able to help stretch out a small section of your upper shoe to help accommodate any bunion/hammer toe, therefore causing less friction and greater comfort. If you suffer from knee or low back pain look for a shoe that has a “wind-up” lacing feature vs the traditional lacing. This means less time bending over whilst trying to lace up, which means less unnecessary aggravation to any existing knee and low back pain. Swing technique matters. Wrong mechanics during your swing and your follow through places additional stress on your joints. This can make your heel pain worse. Add this up swing after swing, game after game…and the effects can be significant and game changing. See your club pro for a lesson to ensure you are using the correct technique for a long and happy relationship with your game. If you need some advice check out resident golf guru (my husband) Steven here. By strengthening and stretching the muscles of the feet and legs, we are effectively helping to stabilise the joints of the feet. Stable feet reduces the stress on the tissues as you walk the course. And the bonus here is less pain in your heels after your round. It is also important to warm up and stretch before exercising. This will loosen up tight muscles and warm the muscles up to make them more elastic and receptive to exercise. 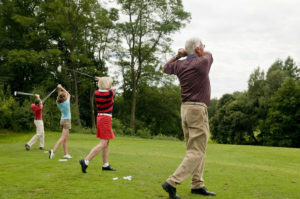 Stretching your calf muscles before teeing off can really help reduce your heel pain. For our favourite calf stretch Click Here! For long term healing and results it is best to get to the underlying cause of your heel pain. By seeing a Foot Mobilisation Therapist or podiatrist they can ease your symptoms and fix the underlying problem. Remember heel pain is not normal. Don’t put up with heel pain – get it fixed so you can keep on playing (and enjoying) your golf. Keep a box of Hypafix Tape in your golf bag for emergencies. If you find yourself in a bit of strife with heel pain mid game, try strapping. The idea of strapping is to help create an arch in the foot to help support the plantar fascia. This can significantly ease the pain you are feeling. Click Here for a video demonstration of a strapping technique. Best Shoes for Nurses, Carers and People on Their Feet? Children’s School Shoes – 7 crucial mistakes every parent should avoid when they buy their child’s next pair of school shoes! Emily Wilson is our Senior Practitioners Assistant at the Foot & Leg Centre. She has a Bachelor of Nursing Degree and has gained extensive experience within the health care setting having worked as a registered nurse in hospital, rehabilitative, remote and aged care facilities; as well as working within the pharmaceutical and chiropractic settings. Emily is the first friendly face you’ll meet at our Kent Town office and is our social media guru, keeping you up to date with health and wellness information, tips and great content.